One of the quotations on the cover of this book is from Vogue magazine and it says: “Best read in a single sitting”. Well, I would definitely recommend you make sure you have plenty of time when you start this book. I certainly found it was a book I didn’t want to put down. Told in the very distinctive voices of 8 year old Carmel and her mother Beth, I found that I wanted to keep reading just another chapter to find out what would happen next. Carmel is a very bright but rather dreamy young girl, quite often in her own wee world. She is prone to being distracted and has wandered off from her mother Beth a few times. In some ways she seems wise for her age, being able to understand what adults are talking about more than you might expect for a girl of her years. On the other hand, as we see when she goes missing, she can be a little too trusting. Her mother Beth is a single parent, estranged from her own parents and doing her best to bring Carmel up on a tight budget. She recognises there is something special about her daughter and worries that she will actually lose her one day. On a trip to a storytelling festival as the mist swirls in atmospherically, that is exactly what happens. The two become separated and Carmel, convinced she is doing the right thing, goes off with a stranger. This book is unusual from the more common missing child story in that, as readers, we know that Carmel is alive. The tension that you might expect wondering whether a missing child is alive or dead is therefore not the focus of the story. Instead we see how Beth’s life disintegrates as the hours that Carmel has been missing turn into days and the days turn into weeks. Of course, Beth is frantic with worry in the early days of Carmel’s disappearance and I could really feel her terror and distress and understand her feelings of guilt at having lost her little girl. Kate Faber has convincingly portrayed Beth’s life as it falls apart and then as she slowly starts to put together a different kind of life while always grasping onto the hope that her daughter may be alive. Carmel is a very interesting character too and I was fascinated to see how she managed to cope with her ordeal. She is told lies by her abductors about what has happened to her parents and believes she has no option but to remain where she is. Although young and distressed about being apart from her mother, she was determined not to lose sight of who she really is and where she was from, constantly writing her name and insisting that she always has a red coat. The reason she was taken by her abductor is quite surprising, probably not something you would guess. Whether you believe in her supposed gift or not, it gave quite a fascinating insight into a certain sector of society. I can’t say more without giving too much away so you’ll just need to read it for yourself and make up your own mind. This is a gripping debut novel and very thought-provoking, one of these books where you may wonder how you would have coped in either Beth or Carmel’s position. 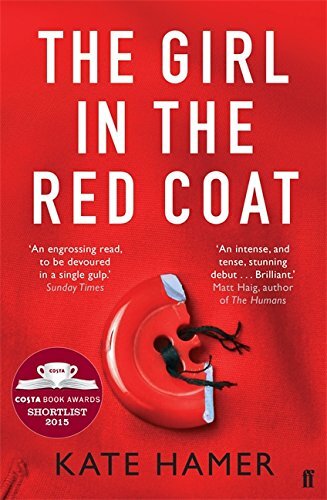 The Girl in the Red Coat is a book which had me hooked and I genuinely had no idea how things were going to work out. I look forward to reading more by Kate Hamer in future. Eight-year-old Carmel has always been different – sensitive, distracted, with an heartstopping tendency to go missing. Her mother Beth, newly single, worries about her daughter’s strangeness, especially as she is trying to rebuild a life for the two of them on her own. When she takes Carmel for an outing to a local festival, her worst fear is realised: Carmel disappears into the crowd. Unable to accept the possibility that her daughter might be gone for good, Beth embarks on a mission to find her. Meanwhile, Carmel begins an extraordinary and terrifying journey of her own. But do the real clues to Carmel’s disappearance lie in the otherworldly qualities her mother had only begun to guess at? Wow! You’ve got me hooked and I haven’t even got the book. It is now beckoning. Thanks Anne, it was a little bit addictive! Oo great review, I’m definitely intrigued! Thank you – it is a very intriguing story! I read and enjoyed it too Joanne – liked the different perspectives and it was indeed a gripping tale. Everyone likes different things of course but I thought it was great.